Hi all! I am brand new to HCA but I have using it for tons of research, so I figured I would join! I am a new crab owner, and have recently been moving Shelldon into a 10 gallon tank with two heaters and a mesh lid (with press and seal on top to keep humidity in). Ever since the switch he has been much more active and doing great! But I have a couple of questions about lighting. I have a dual lamp fixture for two lights: one Zoo-Med 25 watt moonlite for nighttime, and one All Living Things 26 watt UVB fluorescent for daytime. During the day I let natural sunlight into the room and when it gets darker in the evenings or from a storm I turn the UVB on for him, and switch it to the moonlite about one to two hours before I fall asleep. My question is: should I leave the UVB on all day, or is it okay for him only having it on towards the end of the day/when it gets darker outside? During the day I am away at classes and I work most evenings, and I am concerned that if I am not around and no one in my family is home to check on him, that if something happened with the bulb or temp/humidity that I wouldn't be able to correct it. At the same time I don't want to have the room getting dark early for him, and when I am home I need my room light to see, I don't want to keep it on all the time and I don't want to constantly be turning it on and off and messing with his schedule. If someone with any sort of knowledge or experience regarding this could help, I would greatly appreciate it! P.S. I am a musician (primarily Saxophone) and I was wondering if anyone knew if practicing in my room or listening to music out loud is at all bad for him? Hello Welcome to the HCA! Hermit crabs need a day and night cycle. I tend to follow whatever is going on outside. I use UVB, and this is my light source. I do not recommend the All Living Things Lights. I only recommend Reptisun bulbs, preferably the HO ones. I also don't like the moon bulbs, but that is me. The saxophone should be fine for your crab. GotButterflies wrote: Hello Welcome to the HCA! Thank you very much! I will be sure to do that! And the light is safe to leave on all day while I am out? YW! Yes, you can always put it on a timer if you wish! I don't use any light sources at all. My crabs get light from the window. Is there a benefit from adding a light source? I would prefer to just keep doing what I am doing, but if it is better for my crabs, I would invest in lights. curlysister wrote: I don't use any light sources at all. My crabs get light from the window. Is there a benefit from adding a light source? I would prefer to just keep doing what I am doing, but if it is better for my crabs, I would invest in lights. In summary, its more of an optinal thing. My little guy was very active even before I moved him into the tank and gave him a light source other than the window. Since many of our species live closer to the equator in region, I do 12 hours of light. I use UVB and a standard household LED light for their day lighting and nothing at night. soilentgringa wrote: Since many of our species live closer to the equator in region, I do 12 hours of light. I use UVB and a standard household LED light for their day lighting and nothing at night. What wattage UVB do you use? I'm finding that my crab is hiding out more in his little hut the past couple of days when the light is on. Not sure if that's a normal thing or not. I just ordered a 13 watt which will be half the wattage of the current one, hoping that might help. I also had another question regarding moonlights (sorry for being an annoyance!). I've seen people say they should only be used for viewing while some use them all night, mine provides a small amount of heat which is good due to it getting closer to winter here, and its a very dim bulb (I have a hard time navigating my room once it goes on for the night), and I was hoping someone could provide some insight into which method is better, of if it is just a preference choice? Again, sorry for all the questions! My LED hood came with a built in night light, not sure if it is an actual moon light or not though. It's only on half of my tank. I generally turn that on after my I turn my daylights off for the evening. I will leave the night light on until I go to bed and may turn it on to see what they are up to if I get up in the middle of the night. I do forget to turn it off on occasion I don't know if it stresses them or not since it only lights up half of the tank. As far as the UVB bulb I use a Reptisun mini 10.0 UVB 13 Watt desert for my crabs. I based that particular bulb off of them being 5-14 inches from the bulb giving them a zone from mid day basking to partly sunny conditions. I have the hole cut into a piece of plexiglass so the rays are not filtered through anything. The UVB is only on one side of my tank. The other side is a standard LED bulb. My crabs seem to stay on the UVB side of the tank when I see them. I don't know if it's due to their wheel, log hide and moss pit all being all on that side or not. Here is the .pdf guide I used on the Zoo Meds site to choose the right bulb for my tank. Motörcrab wrote: My LED hood came with a built in night light, not sure if it is an actual moon light or not though. It's only on half of my tank. I generally turn that on after my I turn my daylights off for the evening. I will leave the night light on until I go to bed and may turn it on to see what they are up to if I get up in the middle of the night. I do forget to turn it off on occasion I don't know if it stresses them or not since it only lights up half of the tank. Very helpful advice! Thank you! I purchased a 13watt Reptisun (either 5.0 or 10.0 idr off the top of my head) tropical UVB. I decided to just do some experiments because I see that everyone has a different experience. I found that for my crab he seems to be more active when I just use natural sunlight and nighttime, simply opening the blinds more in the morning and letting the day run its course has made him just a bit more active. When the UVB was on he tended to hide in his hut more and only come out every once in a while, my lamp is about 10 inches above the substrate but the light definitely seemed a little strong for him at times. He also seems to be on his cycle again, in the mornings he's usually hiding up in his coconut hut, I decided that every once in a while I will use the UVB for some added lighting during the day, especially if its a naturally darker day, but because of their internal clocks and the fact that its not always bright and sunny in the Caribbean I usually just let the natural light be his light. As for moonlight I use a Zoomed moonglow 25 watt bulb, it adds a small amount of heat for him (which is good for these soon to be winter nights) and I only use that a few nights a week, the light is a very dim purpleish-blue and it doesn't seem to affect his activity at all, so I don't think it stresses him out, its supposed to simulate star and moon light after all. My nighttime schedule for him seems to be 2-3 nights a week I'll use the moonglow either before I go to bed (and sometimes all night), other nights I'll leave it dark, and every once in a while I will turn my moon lamp on dim (its this cool mini moon that lights up) and I feel that could simulate some light for him as well. I don't want every night to be pitch black! Land hermit crabs are crepuscular, meaning that they come out around dawn and dusk usually; they're fairly nocturnal so they aren't going to come out a lot in the daytime. 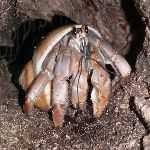 soilentgringa wrote: Land hermit crabs are crepuscular, meaning that they come out around dawn and dusk usually; they're fairly nocturnal so they aren't going to come out a lot in the daytime. I have noticed that, my crab is also sometimes very active all day and night, and then will sleep for a longer time. Safe to say that he is fairly active at night, and on some days active in the morning and I have no clue what he does while I'm out. Two days ago he sat up on a piece of cholla wood and stayed there for about a day and a half, and then today he moved around a lot and is now asleep on the cooler side of the tank. I think they seem to not be super rigid about their nocturnalness, I read a lot of posts from people saying they aren't exclusively nocturnal, but I am no expert, by far. I've noticed my purple pinchers tend to seem more nocturnal while my Ecuadorian seems to be active almost all of the time.